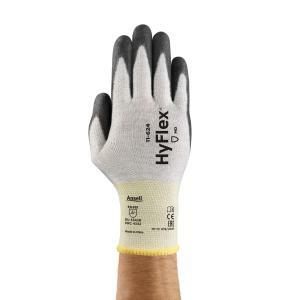 HyFlex® 11-624 gloves provide comfort and dexterity. Easy to wear during long working hours, they also offer users a “cool feeling” as well as a secure grip on dry to slightly oily pieces for sure handling in a wide range of environments. The liner is made with a yarn structure containing Dyneema®, the world’s strongest fiber. It therefore offers strong cut resistance for the safe handling and assembly of sharp pieces.